Birthplace : Pittsburgh, Pennsylvania, U.S.
Eugene Curran Kelly was born in Pittsburgh, Pennsylvania, on August 23, 1912, the middle son of five children. His father was Canadian-born and loved sports, especially hockey. Every winter Kelly Sr. would flood the family backyard and make an ice rink for hockey. Kelly Jr. later credited hockey for some of his dance steps, which he described as "wide open and close to the ground." At fifteen Kelly played with a semiprofessional ice hockey team. He also played football, baseball, and participated in gymnastics. Kelly's other major influence was his mother, who loved the theater. She was the one who sent him to dancing lessons. At first Kelly did not want to continue with his dance lessons because the other students made fun of him. But then he discovered that the girls liked a boy who could dance, so he decided to stick with the lessons. In 1929 Kelly left for Pennsylvania State College, but because of the Great Depression, his family lost their money. The Great Depression (1929–39) was a time of worldwide economic trouble that led to global unemployment and poverty. Kelly had to move back home and attend the University of Pittsburgh in order to save the cost of room and board. While at the university, Kelly worked at a variety of odd jobs to pay his tuition: he dug ditches, worked at a soda fountain, and pumped gas. Kelly's mother began to work as a receptionist at a local dance school. She came up with the idea of the family running its own dance studio. They did and the studio was a big success. After Kelly graduated from the University of Pittsburgh he taught dance for another six years. In 1937 he left for New York City. He believed that he was talented enough to find work and he was right. He got a job in theater his first week in New York. Kelly's big break came in 1940, when he was cast as the lead in the Rodgers and Hart musical Pal Joey. Producers from Hollywood saw the show in New York and offered Kelly a contract with Metro Goldwyn Mayer (MGM). He worked for MGM for the next sixteen years. His first Hollywood film was For Me and My Gal (1942), in which he starred opposite Judy Garland (1922–1969). Garland was only twenty, but already a major star. She had seen Kelly's work and insisted that Kelly have the role. She tutored (taught) him how to act for the movies. Kelly made a breakthrough with Cover Girl (1944). At one point in the film, his character dances with a mirror image of himself. It caught all the critics' attention. Kelly told Interview magazine, "[That is] when I began to see that you could make dances for cinema that weren't just photographed stage dancing. That was my big insight into Hollywood, and Hollywood's big insight into me." Kelly's experiments with dance and with film technique included combining the two, as demonstrated in such films as Anchors Aweigh (1945), where he danced with a cartoon mouse, An American in Paris (1951), and Invitation to the Dance (1956). His first attempts at film choreography relied on the established formulas of the film musical. Later he developed a system of choreography made for the camera that took into account camera setups, movement, and editing. Many people believe that he was the major influence in creating a new form of American dance, one that was different from the more formal and ballet styles of European dance. Kelly danced in a more energetic, athletic way. Kelly often played a guy who felt that the best way to get what he wanted was to impress people. However, he learns that his brashness (self-confidence without politeness) offends people. In the end he succeeds by being himself. Kelly's characters had much of the "average guy" in them and this quality appealed to audiences. His characters seemed so natural that people who saw his films did not always realize how very sophisticated (complex) his dancing and choreography were. Nowhere was Kelly more engaging than in 1952's Singin' in the Rain. One of the all-time great movie musicals, and perhaps the film most associated with Kelly, this comedy is about late-1920s Hollywood and the change from silent pictures to "talkies" (movies with sound). Singin' in the Rain showcased the considerable acting, singing, and dancing gifts of Debbie Reynolds (1932–) and Donald O'Connor (1925–), but it was Kelly who danced away with the movie. His dance to the title song has become an icon (something that is regarded as the ideal) of American entertainment. Kelly made a drenching rainstorm and umbrella his partners, and communicated the joy in movement at the heart of all of his performances. Gene Kelly died on February 2, 1996, in Beverly Hills, California. He will always be remembered for his incredible contribution to the movie musical through dance performance, choreography, and photography. 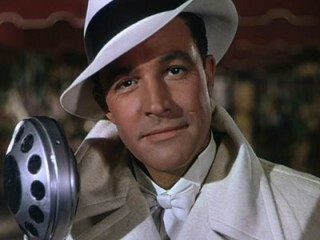 View the full website biography of Gene Kelly.